We’d love your help. 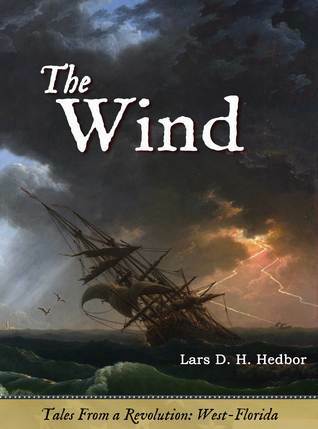 Let us know what’s wrong with this preview of The Wind by Lars D.H. Hedbor. To ask other readers questions about The Wind, please sign up. First i received the audio of the book and it about 5 hr long it was great listen to book the author told you the story of the revolution and then it tell you how it started and why.The war was rough on a lot of people some of them left the land and found a area were there no running water and they are on the island to survive they were promised a lot and got nothing but hurt and death. The war started and then the Pioneer on the island are making it by the skin of there teeth through sickness an First i received the audio of the book and it about 5 hr long it was great listen to book the author told you the story of the revolution and then it tell you how it started and why.The war was rough on a lot of people some of them left the land and found a area were there no running water and they are on the island to survive they were promised a lot and got nothing but hurt and death. The war started and then the Pioneer on the island are making it by the skin of there teeth through sickness and they have to share with all that there the boat that brought them there said they be able to get back to them with more surplus but never happen. So the men hunt and then the women clean and prepared food for all but a storm come in and ship is wrecked and now the thing might change but i am the only one to survive so i have to figure how to get off the island. But i am following in love with some one and then when the vessel come and they tell me i have to go back but i do not want to but i tell my love i will be back before the war is over.You see the war goes on and friends and love one are killed but you have to go on .I made friends. I’ve become a dedicated Lars Hedbor fan. In his Tales of a Revolution series, he takes little-known stories of the Revolutionary War and brings them to life with flair and beauty. Each one has deeply satisfied the history buff within me. And The Wind, in my opinion, is his most dramatic novel yet. The military action is not as intense, but the sea add an unpredictable element of danger. And I found the human story in this one to be the most compelling. But my favorite part of a Hedbor novel is a I’ve become a dedicated Lars Hedbor fan. In his Tales of a Revolution series, he takes little-known stories of the Revolutionary War and brings them to life with flair and beauty. Each one has deeply satisfied the history buff within me. And The Wind, in my opinion, is his most dramatic novel yet. The military action is not as intense, but the sea add an unpredictable element of danger. And I found the human story in this one to be the most compelling. But my favorite part of a Hedbor novel is always his incomparable vernacular. When I read one, I feel like I’ve stepped back in time and am listening to conversations taking place between the people who lived and loved and fought there. The Wind tells the story of the action taking place in the Gulf of Mexico between Spain and England. I had known the Revolution was actually a World War, and I had known Spain had played a role. But I was very hazy on the details and the characters and the locations. Mr. Hedbor served the history to me with a nice side of humanity. His fictional hero Gabriel Llalandro Garcia y Covas was a quarter master aboard an Hispanic merchant vessel before a hurricane lands him in the middle of a small village where he finds purpose, intrigue, war, and love. Gabriel has a wonderful quote near the end of the book that seems to me to capture the sentiment of many caught up in wars not of their own making: “I am…eager for this entire enterprise to be complete, that we may return to our homes and resume the lives that we pursued before the needs of kings upended everything.” The Wind gives a beautiful glimpse into the lives that made up that very human drama, the American Revolution. The American Revolution being part of a larger world war is an idea that many people don’t touch upon, or disagree as to the accuracy of such an association. However, it remains true that many British saw our rebellion as part of French technique to run them down, and Spanish losses during the Seven Years’ War influenced their involvement against the British when the thirteen colonies declared their independence. Surely not forgetting the seizure of Havana, the Spaniards set themselves up to avo The American Revolution being part of a larger world war is an idea that many people don’t touch upon, or disagree as to the accuracy of such an association. However, it remains true that many British saw our rebellion as part of French technique to run them down, and Spanish losses during the Seven Years’ War influenced their involvement against the British when the thirteen colonies declared their independence. Surely not forgetting the seizure of Havana, the Spaniards set themselves up to avoid a repeat, later aiming to re-take Florida, which had been divided by the British into east and west. 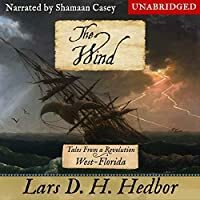 Thus it is in West Florida that Lars D.H. Hedbor sets The Wind, which opens with a dramatic hurricane scene that nevertheless has a feel of calm, as Gabriel falls from a noisy and chaotic sinking ship, into a quiet bliss, taking in the welcome stillness and warm water. The whistling of the wind in the rigging, the desperate shouts of men struggling to make themselves heard over the storm, the crash of water against the sides of the ship, all were silenced. Gone, too, were the cracks and thuds of falling spars, the hoarse cries of surprise wrenched from the throats of men as they were swept from the decks, and the deep, muffled boom of the thunder. The passage has a peaceful effect on readers as well, and it is not difficult to imagine how someone might be lulled into the quiet arms of death by drowning. This introduces The Wind as perhaps the most intense and powerful installment in the Tales From a Revolution series I’ve read thus far, and that’s saying something, given Hedbor’s previously demonstrated and considerable skill in transporting readers to the moment, bringing events to vivid life and enabling an audience to see the era through the eyes of his characters, who are drawn with a deep understanding of the time and locales in which they live. Here the author goes one step further in portraying a Spaniard, as opposed to an American colonist, freshening up an already-lively series with a whole new, larger perspective. The storm that washes Gabriel onto the shores where he meets Carlotta, preceded by Governor Galvez’s plan through covert operations to aid the American rebels, also brings a number of changes into the lives of the people in its midst. The bold plot is “swept aside now by the unpredictable power of the storm, a factor that [Gabriel] suspected was not doing as much harm to the plans of their enemies upriver.” As Gabriel recuperates in Carlotta’s ramshackle dwelling, she embarks on a search for her husband, Paulo. As Hedbor moves his story along, his competency as a writer is easily apparent. Enabled by third-person narration, the author skillfully weaves in and out of Gabriel’s point of view and his observations of Carlotta’s emotional state. Shortly after awakening the subsequent morning, “[h]is expression formed the question that she answered with a slow, sad shake of her head.” Following a few words, she “punctuates her conclusion with a deep sigh” and after a quiet conversation, her shoulders shake “with the unrelenting sobs of the bereaved.” The intervening dialogue strikes a balance in their exchange, and the tale has established itself as readers eagerly anticipate learning the fate of Paulo as well as what Gabriel plans for his future. As the narrative continues and Gabriel’s fate opens before him, Hedbor adds more plotlines, to include murder, siege, betrayal, shipboard battle—and a foray into magical realism. The protagonist feels obligations toward the villagers, but yearns for his sailing life as he strains to cope with the growing conflicts, personal and political. “It is a matter of our honor and our duties as subjects of King Carlos of Bourbon, in Madrid … [h]e says to fight in his name, and we can do no other." Still she scowled at Gabriel, answering, "The King is not living in a hut far from his real home, counting his blessings for every potato that some far-off benefactor deigns to send him …. You ask whether our progress here satisfies me, without ever asking me once whether the goal you work toward is anything that I want. Perhaps I was not interested in re-building these shacks, and waiting for the next storm to blow them into splinters." That Hedbor so succinctly and brilliantly speaks from such a wide variety of perspectives, whether within one novel and the opposing ideals of two or more characters, or when examining his other works in which he presents stories from such a diverse sampling of colonists who lived over 200 years before—this is nothing short of awe inspiring. His dialogue and its attendant character gesticulations and facial movements, depicted or observed, the narrative that flows so smoothly, contains such a trove of experience and understanding; it moves with fluidity and grace, despite the great import of its prose and importance within. We take in an entire world with the expenditure of only a few words. This is carefully crafted art, consummate storytelling, and while Hedbor’s previous novels* are radiant, The Wind champions what people have been doing for thousands of years, and fulfills the inbuilt human yearning to be told a story. As we move closer to the Spanish attempts to wrest back from the British what was taken and divided, we encounter yet more storms, the wind of which carries in what seems like certain fate (see derived hurricane tracks here). Galvez’s forces take their aim at the Siege of Pensacola, the portrayals of which are perhaps the most skillfully executed in the entire novel. Whether inevitable defeat etched out in the scenes sailors witness, anger, upswept optimism or the burden of silent losses, readers are carried on and feel each wave as the pages turn, sense the rise and fall of fortune like the ebb and flow of the sea, smell the salt air that inspires and the longing of separation. While not typically in genres that I read – The Wind was an awesome tale of Revolutionary War-time West-Florida and is really a story about people. Hedbor’s storytelling is just that – it’s reminiscent of the older stories that you hear from “way back when”. Obviously, he’s telling a story about a long time ago but you get that authentic and honest feeling when you listen to it. He was able to bring a story about a time and a place that I don’t know much about and draw me deep into the sand and the ocean of that area. I think with the popularity of Hamilton – this era of history is going to become more and more popular and Hedbor’s The Wind is just one of many Revolutionary War timed stories. I love the fact that he picks a certain place and just goes deep into it. He brings stories that you definitely didn’t hear or read in History class and makes them jump off of the page. I can honestly say, growing up in Pennsylvania that I knew very little about Florida (or the Spanish’s involvement in some of the battles). But after reading The Wind I feel like I know more (even though the story is fictional) and it makes me want to read more on the subject. Again, we see the events of this time through the eyes of a few people. They are not integral to the decisions made at this time. They are average people trying to deal with their position in life during this tumultuous time. Gabriel gets washed up on shore when the ship he was on (that was headed up river to attack Baton Rouge) gets wrecked in a storm. He is found by Carlotta while she’s out looking for her husband who was lost in the storm. The locals (who were relocated by Govenor Galvez) tak Again, we see the events of this time through the eyes of a few people. They are not integral to the decisions made at this time. They are average people trying to deal with their position in life during this tumultuous time. Gabriel gets washed up on shore when the ship he was on (that was headed up river to attack Baton Rouge) gets wrecked in a storm. He is found by Carlotta while she’s out looking for her husband who was lost in the storm. The locals (who were relocated by Govenor Galvez) take care of him until he’s recovered from his injuries. Torn between his responsibilities to his King, and staying to help his new friends and Carlotta, he joins the crew on another ship and heads back into the war. This is the third book I’ve read/listened to by this author and I would gladly listen to another. I am really enjoying these books about the revolution. This is the third book I’ve listened to by this narrator ( Shamaan Casey ). He does well reading the conversational languages of the day. The voices he uses for the characters are not very different, but the are able to be differentiated. I enjoy listening to the sound of his voice. History I never knew told in a fascinating way.I loved it! I will have to look for more from this author.Shamaan Casey has a wonderful voice and talent for narrating this book.I was given this book by the narrator,author or publisher free for an honest review. When one thinks of America's Revolutionary War, some of the things that might come to mind would be Lexington and Concord, Bunker Hill, Valley Forge, and Crossing the Delaware. These and other events, as well as personalities such as George Washington, Paul Revere, Thomas Jefferson, and Benjamin Franklin, are what most people know about the war. However, in Lars Hedbor's sweeping fictionalization of the war, he reminds readers that there was much more to the war than the basic historical accounts When one thinks of America's Revolutionary War, some of the things that might come to mind would be Lexington and Concord, Bunker Hill, Valley Forge, and Crossing the Delaware. These and other events, as well as personalities such as George Washington, Paul Revere, Thomas Jefferson, and Benjamin Franklin, are what most people know about the war. However, in Lars Hedbor's sweeping fictionalization of the war, he reminds readers that there was much more to the war than the basic historical accounts we all were taught in elementary school and high school. To be sure, Hedbor has made this period more accessible and the history more intimate in the same way the James Michener, James Clavell, and Michael Shaara did in their historical fiction. In Hedbor's ambitious project, he's looking at each individual colony in his Tales from a Revolution series, as well as Nova Scotia, and in his most recent offering, West-Florida. The history of this era comes alive in this poignant and evocative story about colonists in West-Florida and Spanish involvement in the war. To be sure, Hedbor sheds light on events in Florida that have been overlooked in other fiction about this era. Like the other novels in this series, Hedbor is a brilliant storyteller when it comes to focusing on one or two individuals and how the war and the times affected them. I have become a big fan of Hedbor's fiction and the books in the series. He's a wonderful writer with a powerful grasp of history and the people who made it.